Few pieces of equipment inspire more trepidation in a cyclist than the dreaded trainer. The trainer generally means that winter is here: no more races to look forward to and no more beautiful sun-drenched afternoons on the bike. Just a bike sitting in the basement, attached to a machine—you pedal it, and it doesn't go anywhere. Well, yeah, but riding a trainer doesn't have to be that bad. Sure, doing four-hour endurance rides on a trainer isn't particularly pleasant, but that's not necessarily what they're designed for. Ultimately, trainers are great at keeping your legs turning during any weather with relatively brief workouts at moderate intensity. And trainers are key to getting in a good warm-up at cyclocross or criterium races or time trials, where space is often limited. If you're new to trainers, you'll notice a few differences from riding on the open road. Trainers tend to put more of the rider's weight in the saddle; since you're not moving, you're not steering or even using your body weight at all to keep the bike going. This may lead to a bit of discomfort, and if you're planning on a lot of trainer rides this winter, a saddle with a bit of extra padding may be in order. Trainer drums also generate quite a bit of heat. This heat can be murder on supple road tires, which may soften, causing undue wear on the tire and coating the drum with a thin layer of rubber. 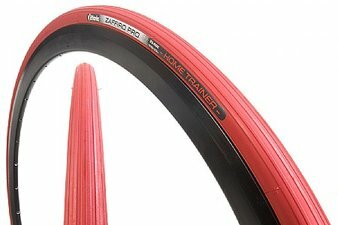 Tires designed specifically for trainer use, like the Continental Hometrainer Tire (700c) or the Vittoria Zaffiro Pro Home Trainer 700c, resist this heat and roll smooth and true. These tires should only be used with trainers. Trainers clamp to the rear wheel pedal, raising your wheel an inch or two off the ground. A drum is pressed against the rear wheel to provide resistance while you pedal, just as road and wind do when you ride outdoors. The front wheel is generally propped up to the same level as the rear, using a block of wood, a phone book, or a specially-designed prop like the Cycleops Climbing Block, which can be set to different heights to simulate climbing and stress various muscles. Wind: Wind trainers use a fan (typically an enclosed turbine fan) to provide resistance. They tend to be a bit noisy and provide less resistance than other types, so they may not be as suitable for stronger riders, but they also tend to be the least expensive trainer option. The low-maintenance Cycleops 2013 Wind Trainer is a great basic wind trainer; the Kinetic 2014 Cyclone Trainer, with its impressive coast-down simulation, is another great choice. Magnetic: Magnetic trainers use two sets of magnets to create an opposing force that provides the resistance. many models offer adjustable resistance. 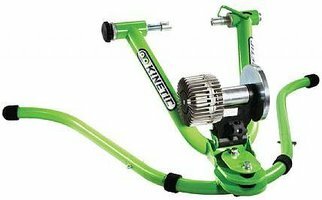 Magnetic trainers can provide high resistance and the better models are reasonably quiet, but the progression of resistance with wheel speed is not quite as smooth as with a good fluid trainer. Both the Cycleops Mag+ Trainer and the Kinetic Magnetic Trainer 3.0 offer bar-mounted shifters to adjust resistance on the fly. Fluid: Fluid trainers use a fan inside a compressed hydraulic fluid to create resistance. Since the fan is immersed in fluid, very little noise is generated from the trainer itself. Fluid trainers provide very smooth progression of resistance and can provide high resistance to satisfy strong riders. Fluid trainers are usually more expensive than other types, but they deliver the best performance. 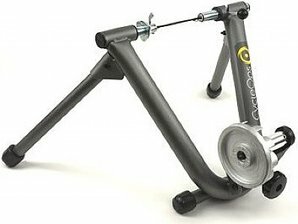 The Cycleops 2013 Fluid 2 Trainer set the standard for high-quality trainers when it was first released, and it continues to perform reliably to this day. The Kinetic Rock and Roll Fluid Trainer, meanwhile, is in a whole new category—it's a trainer designed to simulate real road conditions as closely as possible, with unique lateral motion so you can focus on both power and technique. As with any training, trainer workouts are most beneficial and effective when done on a regular basis, following a training plan. We also like to train with a heart rate monitor, which helps us gauge the intensity of our workouts. If you know what heart rate zone you're riding in, it's easy to keep workouts productive and really develop aerobic capacity through the winter. We've also got an article full of trainer workout ideas that should keep you engaged and riding all winter. Despite their boring rep, trainers are a valuable tool for maintaining your condition when conditions don't lend themselves to outdoor training. Get comfortable, throw on your favorite DVD, listen to some music, whatever you have to do. The payoff will come when you enter the race season fit and ready, while your competitors take weeks to find their form. Any questions about the right trainer for you, or how to get started? Contact us at [email protected] or 1-800-682-0570.